Pro/rel and the “Fricker Plan”: Killed or never was? 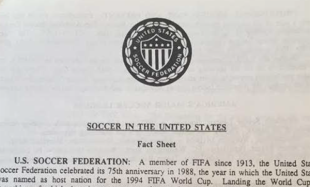 Over Labor Day weekend, the Twitterverse was atwitter over a two paragraph excerpt from an undated USSF document apparently issued in late 1989 or 1990 with the title “Soccer in the United States” (click here to download a PDF of the document, which was provided by Daniel Bona). It’s a four-page communiqué containing general background information of the sort journalists regularly receive in a press packet, hence the “Fact Sheet” subtitle. The [USSF] has developed a plan for the reorganization of professional soccer in the United States. The plan calls for a First, Second and Third Division professional structure, with a system of promotion and relegation that will be unique to American professional sports. Under the new system, any community in America, provided it meets the proper standards, could field a team in the new professional league [emphasis added]. Pretty exciting stuff, to be sure. However, as lawyer and historian I am a bit uncomfortable with staking a claim of “open leagues and three levels of professional soccer with promotion and relegation between them” on a few vague lines in one paragraph of a four-page press release. So, I decided to do a little research. The net result: To be sure, there were some dirty dealings going on at Soccer House at the time. This is not news and has been widely known–in 1990, Fricker was removed as USSF President after a hotly-contested election, with the victor a FIFA-supported candidate in Alan Rothenberg. But, “killing” pro/rel was not among the dirty dealings, because a true open system was never on the table. Before taking a look at what I will refer to as “Fricker Plan” did say, let’s take a look at what “The Future of Pro Soccer” section in the press release does and does not say. Bearing in mind this is a press release, if USSF’s intention was to announce that any community could one day have a major league team, you’d think they would do a much better job of proclaiming that to the world. Indeed, the document explains “rigorous membership standards” are to be developed with USSF “working diligently” to establish professional teams “in key metropolitan areas.” The release is rather muted in its announcement: three divisions, a “system” of pro/rel, and an invitation to your community to host “professional soccer.” That’s it. Yes, the statement is not a model of clarity. And, to be sure, read in a vacuum, one could fairly presume that Fricker was calling for full-blown “open league” professional soccer. The thing is—there isn’t a vacuum. Since this passage is up for interpretation, it would be prudent to look for the actual Fricker Plan rather than reaching the conclusion there was a plan for “open” professional soccer based on a two-paragraph summary. Failing that, perhaps digging into contemporary reports might provide further details. Before we do that, however, let’s review why the plan was even constructed at all. On July 4, 1988, FIFA announced that the United States would host the 1994 World Cup. At the time, this was considered unbelievably risky. Why? Among other things, the United States did not have a Division One outdoor soccer league. Indeed, its most recent effort in that regard (the original North American Soccer League) had crashed and burned only four years earlier. Because of the risk, hosting the tournament came with some strings attached. Foremost among them was that a Division One league must be in place by 1992, so as to whet the appetite of the American soccer fan for a world championship tournament. The USSF took this responsibility seriously. On July 7, 1988, a mere three days after winning the hosting tights to the 1994 World Cup, USSF President Werner Fricker announced that, while the details of a league system had yet to be worked out, a three-tier system was envisioned. Beginning with the lowest tier, “Level 3” would include amateur teams competing within a single metropolitan area or state. “Level 2” would include semiprofessional teams competing on a regional basis. “Level 1” would be a national professional league. Berkowitz was informed. The question is: How did he know the difference? Isn’t it possible that he made this distinction because this is what Fricker explained to him? In any event, this was early in the game–even Fricker had no concrete plans yet. Perhaps the pro/rel concept was incorporated later. As it turns out, a detailed presentation on the “Fricker Plan” was made at the 1988 USSF Convention held in Philadelphia three weeks after the historic FIFA announcement. As it was a local event, the Philadelphia Inquirer sent Dave Caldwell to cover the meeting, and he reported on it in the July 27, 1988 edition of the paper. A third division of eight 12-team “subregional” amateur leagues. “A traditional soccer city such as Philadelphia could have its own league,” said USSF secretary Keith Walker, shamelessly playing to his audience. There was NO mention of teams moving up to Division 1, or bad Division 1 teams getting moved down. Now, it must be said if the Fricker Plan included the concept of teams getting promoted to the “major leagues,” one would think that would be pretty big news, no? But Caldwell did not report that. So he either “buried the lede” in a manner that even someone working for their high school newspaper would not, or he reported the facts accurately. As the former is highly unlikely, we must go with the latter: The promotion concept did not include Division One. There were also several UPI wire service reports arising out of the convention, one of which included a lengthy interview with Fricker. None of the wire reports mention pro/rel. As the Caldwell article does mention promotion and relegation between the minor leagues, the absence of any mention of pro/rel in the wire service articles is again a strong indication that Division 1 pro/rel was not part of the Plan–unless UPI veterans were also remarkably adept at burying the lede. Finally, Soccer Digest reprinted the Caldwell article in its Dec/Jan 1989 issue. No corrections or additions referencing full promotion and relegation were made. Not coincidentally, promotion/relegation between Division 2 and Division 3 was the model the USL would follow for years. However, even there, promotion and relegation was more economically based then on on-field competitive performance. While contemporary news reports shed some light on the specifics, it is a very dim light. In the absence of the actual Plan, there is one more source that might provide additional details: participants in the development of the Plan. In the Post article, Fricker indicated that the details of the league system was being formulated by, among others: Fricker; American Soccer League Commissioner Chuck Blazer; USSF International Games Committee Chairman Sunil Gulati, and International Games Committee member Ted Howard. Mr. Fricker passed away many years ago, and the others are still either involved with U.S. Soccer or–in Blazer’s case–have other problems right now. There was at least one other person involved in the committee, however. Clive Toye has been an institution in U.S. soccer since 1967, beginning with his involvement with the original North American Soccer League. As a “neutral” witness, Mr. Toye’s recollections could shed some light on the subject. Regrettably, Clive did not have a verbatim recollection of what was going on in 1988 when I spoke to him. “I’m sorry to tell you I have no memories whatsoever on the ‘divisional’ subject–none,” he said. However, he did have some pretty clear remembrances about how detailed the project was, and how he bailed out when the rules, regulations, and complexities overwhelmed. Interestingly, he also offered that the process of establishing a Divison 1 league progressed and improved considerably after Alan Rothenberg became involved as USSF President. While it is disappointing that Mr. Toye could not distinctly recall the details of the Fricker Plan, it is telling that he did not have any clear memories on the promotion/relegation issue. Again, if an open league was on the table, that would certainly be something worth remembering. The fact that he does not remember much on the “divisional” aspect strongly suggests this is because pro/rel was never really a part of the plan to reorganize professional soccer in the United States. In labor law, parties live under collective bargaining agreements. Not surprisingly, parties cannot anticipate every possible scenario, and often find themselves battling over how ambiguous language might be applied to such scenarios. When they cannot agree on what they intended, they bring in an arbitrator. Arbitrators will look at lots of evidence–prior versions of contract language to track the evolution of the current language, bargaining notes, past practices–to try to determine the parties’ intent. Many times, the end result is an educated guess–but one that breaks the tie and with which the parties then live. I have tried to apply those principles here. Confronted with an open-ended statement in a press release, I have tried to collect evidence from different contemporaneous sources to ascertain just what the Fricker Plan called for. We know that some form of promotion and relegation was involved at some point in the plan–the press release makes that clear. The question is: just how far was pro/rel intended to be extended? The fact that there is no “institutional memory”–in other words, everyone was surprised to hear that full pro/rel was a possibility, and no one has stepped forward to state that they recall it being a part of any plan–also strongly suggests this is because a fully open system was never really an integral part of the plan. All told, I would conclude that there was a Fricker Plan, and that promotion and relegation within a three-tier system was part of that Plan. However, I would also be constrained to conclude that said promotion and relegation was limited to the minor leagues, and was never intended to include Division 1. As is the case with arbitrators, I am making an educated guess. However, at this point, in the absence of the actual Fricker Plan, that’s all any of us can do. I know this piece will not be well met by certain segments of the soccer community, as it does not fit certain narratives and preconceptions. For instance, it has already been suggested the presence of Glazer and Gulati on the committee is proof that pro/rel was “hijacked.” This accusation is made despite the simple fact neither of them was yet the figure they have become. More importantly, both were involved in the process from the start, which means they would have been part of the team that announced the (limited) pro/rel structure in Philadelphia in July 1988. Some might also suggest that, as the press release was issued in late 1989/early 1990, this is evidence that the Fricker Plan did evolve to include unlimited promotion and relegation. However, it should be noted that a June 21, 1990 New York Times article by Michael Janofsky entitled “Outlook Hazy on Bringing U.S. Success in Soccer” included a section sub-titled “European-Style Club Circuit” with, again, no reference whatsoever to promotion and relegation. Again–if an article was going to focus on “European-style,” one would expect it to trumpet the fact that promotion and relegation was part of that style. It did not, because full pro/rel was never part of the Plan. What the article does mention is also telling: a closed, single-entity league, with the entity being the USSF itself. In other words, if the Fricker Plan was evolving, it was evolving in the direction that led to MLS, not away from it. As a historian, I am interested in facts…complete facts. For what it is worth, I am going to continue to search for what would be the ultimate arbiter on the subject–the Plan itself. If there was an early plan for full-blown promotion and relegation at the professional level, that is something that needs to be known and publicized. In the meantime, I wanted to share what I have learned thus far in the hope that readers will perhaps not be so quick to assume the discovery of some Holy Grail proving open professional league soccer with full promotion and relegation in the U.S. was in motion before a nefarious coup led by future MLS denizens took it all away. Great stuff as always Steve. Awesome job. Thanks for writing. +1. Great stuff, as always. Good work. With the results that we see some 27 years later, it seems the plan constantly changed anyway. There’s nothing here. You took the facts that US Soccer published that they had a promotion and relegation plan in place, and then for some reason abandoned it, and just restated it. You didn’t call the release bogus. You didn’t say the author was lying. Your only live source couldn’t remember anything. Blazer and Gulati were in on this. What do they say? It would have been interesting to find out how we got from a US Soccer plan for promotion and relegation over 3 divisions to Gulati, Blazer and others in on modifying it, to Fricker being ousted by a former NBA executive with the help of a former ABA executive. But, we didn’t get that story. All we really got was something like – Yes, USSF had a promotion and relegation plan in place, and then it disappeared, and we didn’t get pro/rel. These are things we already knew. Ted Westervelt, everyone–feel free to put your name to this–and the best you can do is try your standard misdirection ploy. No one was questioning that the press release said “pro/rel.”. The question was what was the breadth of it. Your narrative wanted it to be open, full blown, all levels pro/rel, and a golden opportunity squandered. The facts, as we currently have them, don’t support that at all. But, like I say–I’m still looking. Maybe you should try pitching in, instead of complaining that you don’t like the result. “How do you like them apples”, Ted. An academically responsible piece of research that recognizes the limitations of its discovered facts, clearly identifies its speculative suppositions as speculative suppositions, and overtly labels its nuanced conclusion as an educated guess. Further the author states his intention to continue to pursue the topic and search for the actual document he surmises might have existed. Do you have evidence there ever was an actual document, or might the term Fricker Plan have been created out of thin air as a concise label explaining something that either ought to have existed or to summarize a melange of vague disjointed facts? I know nothing of journalism’s standards; I do know that a well writing historical summary given as background written under older standards of attribution seemed to require a footnote for every explanatory adjective. I also know that using such adjectives or other “concise phrase modifiers” if you will forgive a history person’s natural instincts to creat necessary terms as he writes, produces effective efficient prose. Does USSF have an archive? What are their policies about granting access if they do, Stalinesque like Major League Soccer or more in keeping with freedom of information? A well done piece that acknowledges its limitations up front and repeats them throughout its body. Full marks for intellectual responsibility, as opposed to proclaiming a crusader’s Holy Grail. 3) At best, no matter who you talk to, their recollections will be clouded by 30 years of distance. All in all I think you’ve done a wonderful job at trying to uncover, what I feel will never be truly known. Nice job. As I read this, my primary thought was that it’s kind of sad someone would actually devote this much time to documenting a topic like this in such minutia. The fact the author states an intention to spend even more time on this is bizarre. The subject is borderline interesting, for a while, but understanding what someone may have planned regarding relegation and promotion 30 years ago IS NOT “something that needs to be known and publicized”. Frankly, James, I don’t disagree–however, if you spend any time on Twitter, say, you know how much (and how divisive) the pro/rel subject is. Over Labor Day weekend, the pro-pro/rel faction announced that the original plan for pro soccer in the US was to have open leagues, and promptly concluded that USSF minions killed the idea in its cradle. Whether a waste of time or no, I felt compelled to point out that that factions’ conclusions were a little skewed. And yet, you took the time to respond to it. You felt THAT was necessary.